Have you ever followed the training program of a running partner, one that really worked for him but it just didn’t yield equally good results for you? That shouldn’t come as a surprise. In fact, there’s no such thing as a ‘perfect training system’ for all runners. Then again, a few tweaks are often all that is needed. In this article, you’ll learn how to tailor your training to your unique genetic make-up. There are many differences between runners. Age, training level, body type, … But there is one characteristic that is invisible to the naked eye: Your genetic muscle fiber profile. Each runner has a unique ratio of fast-twitch to slow-twitch muscle fibers that comes with strengths and weaknesses. This is the reason why 2 different runners often respond differently to the same training plan. The fast-twitch runner (FT runner): An extreme case of fast-twitch runners are world-class sprinters. They’re endowed with up to 80% FT fibers. Hence the saying: “Sprinters are born, not made.” However, when we speak of FT-runners within the domain of distance running, we refer to middle-distance runner types (800m and 1500m) with roughly a 50/50 FT to ST ratio. The slow-twitch runner (ST-runner): This type is found at the other end of the spectrum. Elite marathon runners are likely to feature up to 80% ST fibers. Those types are incredibly fatigue resistant and metabolically efficient but they won’t have a strong finishing kick, nor are they able to respond to pace changes as well as the FT types, who can temporarily draw upon their anaerobic capacity. Most of us fall somewhere in between the 2 extremes. If you beat competitors of a similar level and training status in shorter events but struggle to hang on when the race distances get longer, then you’re an FT-runner. ST-runners, by comparison, thrive at half-marathon and marathon events. Whichever your event, the training itself has to be adapted to the type of runner you are. Strengths of ST-runners: A fairly high weekly training mileage, frequent easy runs, recovery runs, and a substantial long run (with possible add-ons) once a week are easily absorbed by this type of runner due to their large pool of oxidative muscle fibers. Long and frequent tempo runs at threshold pace (15K pace or HM pace for faster runners) are also highly beneficial for ST-runners. 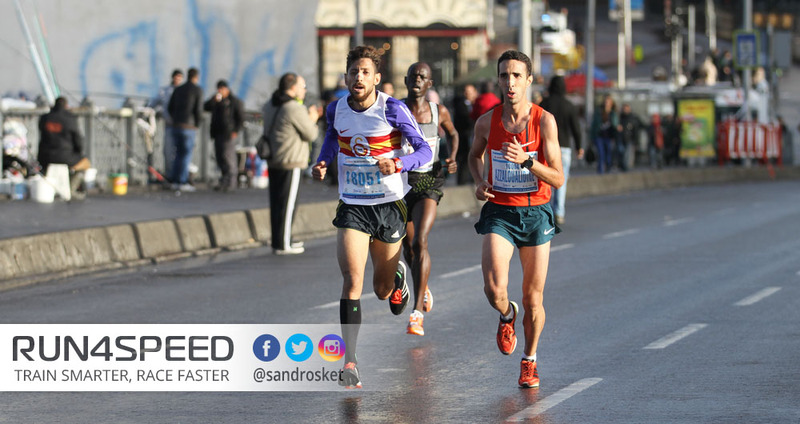 Weaknesses of ST-runners: When it comes to training intensities faster than 5K-pace, such as VO2max intervals and sprint repetitions, ST-runners are challenged because their anaerobic potential is limited. A top-down approach works well, where the workload is high from the beginning with a slight but continual rise in intensity in the weeks ahead. Strengths of FT-runners: Speed work and short VO2max intervals (at 3K pace) come naturally to this type of runner due to their large percentage of glycolytic muscle fibers. Hence, they respond quickly to this type of workouts and can they bounce back quickly from them too. Though, rest intervals should be longer compared to ST-runners, preferably with walking recoveries. Weaknesses of FT-runners: A moderate mileage is more appropriate as their fat-metabolism is not as well-developed as their counterparts, which strains glycogen stores. Easy runs should be a tad slower, and long runs don’t have to be excessively long. Tempo runs can be run rather slow (marathon pace) or quite short and fast in the form of cruise intervals (10K – 15K pace). In summary: General principles of training apply to all runners. But total weekly mileage, the exact intensity, and the emphasis on particular workouts all factor in for optimal training according to your type of runner. You’ll be surprised how a few changes to your training program lead to faster race results with a reduced risk of injury and burnout. Adapt the training plan for you, and not vice versa.